Helpful tips for choosing the best water slider rental!! Children’s birthday parties are made more exciting when there’s a water slider rental for kids to play in. Kids are super active, and unless you want them running like crazy every few minutes at a party, you should provide them with something to spend their energies in. While having a different stream of party games would be nice, why not rent a water slider instead? These inflatable sliders offer the little ones all the fun and thrill that they need for the day. But, not all water sliders are made the same and finding the right company to rent them can be quite tricky. A lot of water slider rental companies advertise their products for rent; however, it can be hard to distinguish the best match for your event. If you are planning to have a water slider at the next party you are about to host, then for sure you would like to get the best, but, you might be lost of choice because of the many companies that offer their rental services in the market. So, to be on a safer side, you should consider a few factors that will buffer you against poor services and will help you make the correct decision. Pricing is a vital factor when it comes to selecting a water slider rental company. Although many people are concerned about the price range and tend to compromise on quality which they regret later. Many rental companies offer a standard rate for the whole event, including the set up of the slider and tear and wear. The best thing for you to do is to research a bit on the rental company you want to rent from. Take time to do a background check, read the reviews and also ask your friends and relatives for recommendations. Note that high costs do not usually guarantee quality and therefore, you need to be very careful about it. Safety cannot be compromised and it is the most crucial point to consider when you want to rent a water slider. To know that the rental company guarantees safety they have to show you details about their insurance policies. This is one of the ways for you to be sure that your guests are protected, more especially if small kids are involved. There is absolutely nothing better than renting a water slider that meets the needs of your specific target guests. If you are inviting lots of guests then definitely you’ll require a bigger slider, however, if the number of guests is less, you may go for the small one as it will be more cost-effective. On the other hand, the age of the kids is also important in the type of water slider that you would prefer. Last but not least, it is also very important to note that many rental companies that offer rental services have water sliders for toddlers too. So, as a precaution, you should remember not to allow older children to use the same slider with small ones. 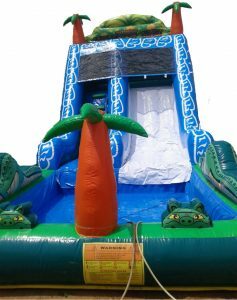 As you can see, there are quite a few effective factors that you should always keep in mind when choosing a water slider rental company. So, all you have to do now is implement these factors and you’ll be a step closer to renting the best water slider for your next party.